It took a while to get settled back to routine after the months of shopping,planning and finally executing the marriage in our family.In the past few months,we had spent so much time in shopping and enjoying it that we now miss it terribly. It is as if we have nothing else to do .Sigh!! So I picked up my anchor stitching kit and started off . The first target was the smallest bush. Here's how the pattern looks. I stitched the leaves on the ground with cretan stitch and the small ones with fern stitch. Once that was done, I started with the flowers.The instructions asked for only one shade of violet,but I felt that the flowers would look too dull. I opted for three shades and used detached chain stitches to stitch them. Then, I noticed that something was amiss. The cretan stitch leaves did not look right. Was it because they were not angled properly? Nope..They did not look bad, but they were not superb looking either. After some thought, I understood what was wrong - the leaves were not filled completely - the white fabric was being seen through gaps between the stitches. It did not look natural enough. Now what?? Should I remove it all and stitch again? I filled up the gaps with straight stitches and this is how the flowery bush looks now. I like it much better than the original version below. What do you think? Just because we have a kit with a set of instructions, does not mean that we've to follow them to the minutest detail. Use your own ideas and give it your personal touch. I have been following your blog for a while now. Thanks for all your work documenting Indian embroidery stitches. good to see you back blogging Deepa and recovered from the wedding. Your stitching is looking beautiful and yes those leaves now look full of life, the shades on the flower work so very well. Your version and the colour shading you selected is a great improvement. Just beautiful. These flowers and leaves look great. Of course you have to give this pattern a twist to make it yours! Welcome back! I agree that kits are not always perfect and it's good to have the courage to change it up to something better. Thanks so much for showing what a workaround is. I am such a "by the book" person & would not have thought to do something the instructions did not tell me. The leaves are SO MUCH better & I'll always keep that in mind in the future. It's just beautiful. Your interpretation is much, much better. I love the shades of purple in the flowers and the full leaves are so much better! Good job Deepa, now let's see what you will do with the rest of the embroidery! Very pretty, and yes, the leaves look better now. I too would have used the workaround rather than start again! 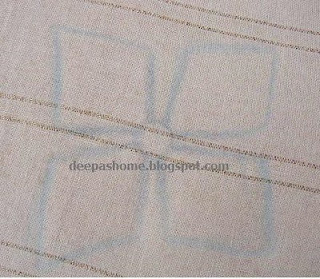 Is it a pre-printed cloth or did you transfer it with a wash-away pen? Beautiful work! Yours look definitely a lot better than the original version. Hello, I've just found your blog via Pinterest. I think it's fabulous! Thanks a lot for the explanations on Indian embroidery (which is the reason I got here). I've got a lot of reading to do in your blog and I'll enjoy every bit of it! Hello Deepa, thank you for your posts. I love embroidery also. Your tuition is good, straightforward, easy to follow. I enjoy reading your blog.